My August Birchbox was a nice mix of samples that I could keep using throughout the season. Themed "Finishing School", this box's focused on items that should polish your look. At first glance in my box, I couldn't help but notice the dark red, Beso- to be exact, shade liquid lipstick by Stila. A good sized lipstick for a color meant to wear on bold occasions. Next, I went straight to the derma e Hydrating Mist and spritzed some onto my face. It can be used to set and refresh makeup as well as to hydrate a bare face and body. Of course I was curious about the other two products- Whish exfoliating body wash in a yummy Coconut Milk scent and Evolvh UltraShine Moisture Conditioner. Jumped in the shower later in the evening to test my new bath goodies. The Whish was a delight and was a nice scrub and the conditioner seemed to work as well. Will give it a few more tries before I make my final verdict. 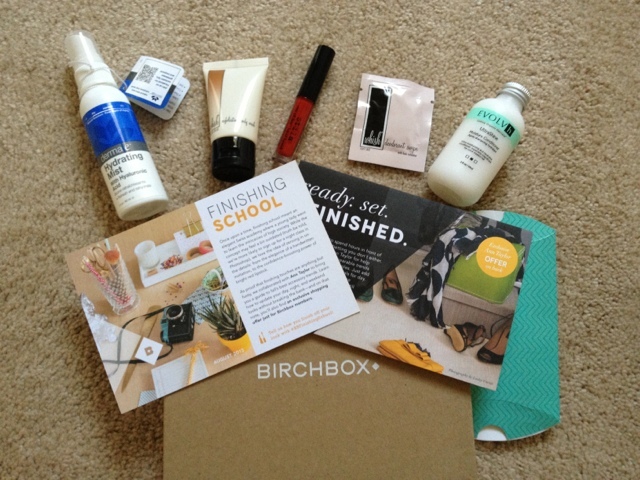 Can't wait until next month's Birchbox! !